We all know that driving in Western New York can be treacherous in the wintertime. Many of us are not as aware, however, that driving on dry roads can also be dangerous if your car is equipped with defective tires. There has been substantial litigation in recent years involving catastrophic injuries resulting from faulty tires or tire rims. Even the threat of lawsuits has caused many tire manufacturers, including Bridgestone/Firestone, Cooper, Goodyear, Uniroyal and Dunlop, to issue recalls of tires that have been shown to crack during ordinary operation, resulting in tire “blow-out” and serious injury or death. Although some tire failures can be attributed to wear and tear and poor maintenance, some tires can fail without warning due to tread problems or premature separation of belts. Hazards can also exist when there is a “tire and rim mismatch.” During the servicing or repair of an automobile, light truck, or other vehicle with small tires, service stations use pressurized air to correctly position the tire against the rim flange. This procedure is referred to as “seating the bead.” The tire bead is the inner edge of the tire that contacts the wheel flange and presses against the bead seat. The danger of serious injury or death is present if a tire of one bead diameter is installed on a rim or wheel of a different rim diameter. While it is possible to pass a smaller diameter tire over the lip of a larger diameter rim, it cannot be inflated enough to position itself against the rim flange. If an attempt is made to seat the tire bead by inflation, the tire bead could break with explosive force. The hazard is present if an individual tries to install a tire on the incorrect diameter rim or is attempting to inflate or service the tire that is already mounted on an incorrect rim. This can be especially hazardous if an individual attempts to repair or inflate a tire that is not properly secured to a tire-mounting machine, the vehicle, or in a safety cage. There have also been reports of serious injuries and fatalities occurring when “split rim” tire assemblies are used. Split rims are a type of rim used especially on larger vehicles such as forklifts, tractors, bulldozers and trailers that contain a “ring” around the outer edge of the rim. 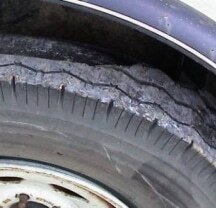 The ring around the outer edge of the rim has a small gap, or split, and is called a “lock ring.” The lock ring that comes with split rims has been known to fly off and can become a dangerous projectile, especially in cases of over-inflation of the tire or damaged or mismatched rim parts. Since serious injuries are not uncommon when handling split rim tire assemblies, most often the assemblies are placed in a strong steel cage when tires are inflated. If you or someone you know has been serious injured as the result of a tire defect, tire failure, tread separation, tire blow out, mismatched tire and rim, or split rim accident, please call BROWN CHIARI LLP for a free evaluation concerning a potential products liability lawsuit.